The purpose of this inventory and the guidelines is to preserve and protect identified burial sites during the preliminary plan stage of the parcel subdivision process, as overseen by the Planning Board. Montgomery Planning’s Historic Preservation Office is responsible for maintaining and updating the inventory, providing guidelines for archaeological investigations and engaging the community in the process of identifying and preserving sites. View the Draft Burial Sites Inventory and Guidelines staff report for the February 21 Planning Board meeting. Based on the Planning Board’s comments and review on February 21, the Historic Preservation Office will refine the guidelines for the burial sites inventory and circulate the draft guidelines for input from the public, property owners, and interested parties. Further outreach events planned for March 2019 will be announced to solicit additional feedback and comments from the public. 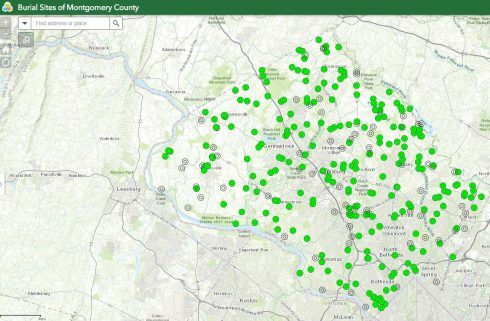 A map of the burial sites inventory, with GIS and attribute data, is available on the Montgomery County Planning Department website. Learn more about the burial sites inventory. Formal efforts to inventory cemeteries in Montgomery County began in 2004. They were supported by grants from the Montgomery County Historic Preservation Commission and sponsored by Peerless Rockville with financial assistance from Historic Takoma, Inc., and the Coalition to Protect Maryland Burial Sites. In 2018, Montgomery Preservation, Inc., a countywide nonprofit historic preservation organization, undertook a survey of cemeteries and burial sites in Montgomery County. Dozens of volunteers visited all of the 266 cemeteries identified during earlier surveys between 2004 and 2010, and conducted historical research to identify more burial sites, bringing the total to 322 sites. Preservation Montgomery developed survey forms and protocols, and trained volunteers in recording GPS coordinates, taking standardized photographs and completing detailed description forms. This effort produced an extensive and reliable inventory of cemeteries and burial sites across the county that will provide the basis for protecting these sites. Furthermore, by developing simple forms and documentation procedures, Montgomery Preservation, Inc. created a template that could be easily and effectively used in the future to survey additional burial sites in the county and elsewhere in the state. On January 31, 2019, at the 44th Maryland Preservation Awards event in Annapolis, MD, the Maryland Historical Trust Board of Trustees honored the burial sites inventory with its Excellence in Community Engagement Award. The inventory is among 11 outstanding efforts in historic preservation that were recognized at the event. Visit the Maryland Historical Trust’s website to learn more about the program and view videos about the awards. For more information, contact Brian Crane at brian.crane@montgomeryplanning.org or 301-562-3402.